Mifflin Square Park Paver Fundraiser is Live! The fundraising campaign for decorative pavers at the entrance of Mifflin Square Park is now Live! This fundraiser arose following several neighborhood park advisory meetings where this was highlighted as a real priority improvement focus for neighborhood residents and stakeholders. In line with this shared community vision, this fundraiser presents the opportunity to mark a distinctive entrance to Mifflin Square Park and to preserve the names of the dedicated neighborhood residents and organizations who have done so much in the park planning process and in the many years before. This campaign will be active until Monday, April 22, 2019 and the goal is to raise $10,000. Individuals who donate $200 or above will be able to have their name engraved at the park entrance as part of these pavers. Organizations are also welcome to contribute and have their name engraved as we know countless organization been a part of improving Mifflin Square Park. If an organization wants to make a collective donation from several individuals on behalf of the organization, we certainly encourage that. After a year and a half of hard work by many Southeast Philadelphia residents and organizations, we are happy to share the Making Room for Everyone Concept Design for Mifflin Square Park. We welcome questions or feedback by email to msp [at] seamaac [dot] org, phone to Neil Garry at SEAMAAC at (215) 467–0690, or commenting on this post. Come join us April 27th, 2019 from 11:00 AM – 3:00 PM for this great community event! We will have many activities for the entire family and an appearance from SoPhiE, your friendly neighborhood food truck! The Cambodian Association of Greater Philadelphia participated in a paver design charrette with the children in their after school program. The afternoon was filled with creative ideas for how to design the future pavers on the corner of South 6th Street and Ritner Street at Mifflin Square Park. Check out the pictures below to see their 3-D model! On Saturday, April 21, 11 am— 4 pm, come to Mifflin Square Park for the Spring Community Health Fair & Vendor Village Kick Off, featuring a Farmers Market, Cooking Demos, Soccer Tournament, Food Truck & Yoga! You’ll also be able to see & ask questions about the Mifflin Square Park Concept Design. 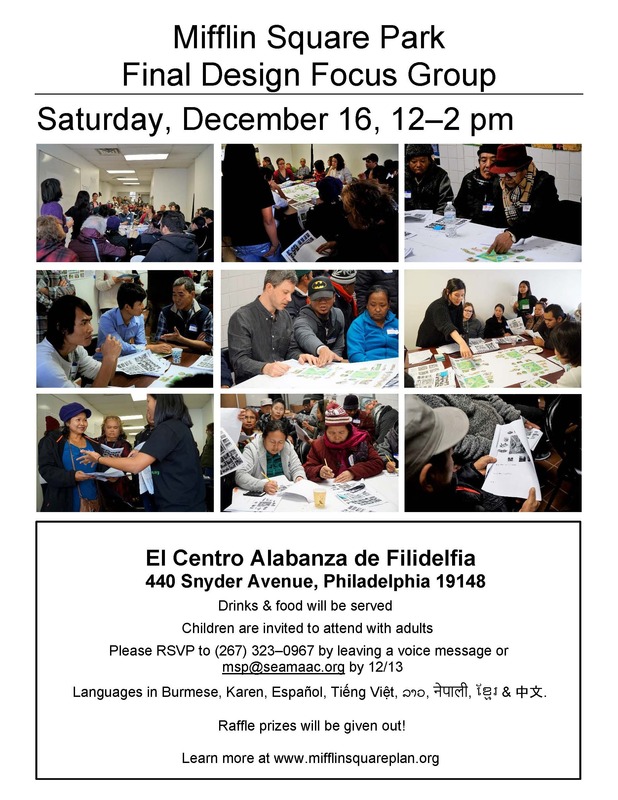 Neighbors gathered on a crisp Saturday morning to discuss and debate draft park design directions for Mifflin Square Park at El Centro Alabanza de Filadelfia. If you couldn’t attend but want to share your thoughts, please fill out a Mifflin Square Park Draft Design Suggestion Sheet! Key Elementary school students tend and care for the garden! On Friday mornings, students from Key Elementary School come help tend Mifflin Square Park’s Gathering Garden by watering the plants and raking the leaves surrounding the garden. It has been a really enjoyable experience and the students learned how to correctly water, plant, and tend to the garden. Students expressed their desires to continue tending the flowers and plants located around the park. Come to the 12/16 Mifflin Square Park Final Design Focus Group!